If this blog is supposed to be about recording the moments of life then one would think I could post pages a day. I could. I should. But—and here is where the joke’s on me—I’m horrible at moment catching. I wake up each morning, before everyone else so I can have a moment or three of quiet. I pour my coffee, add a little cream. Then I pad lightly down the stairs so as to not drip coffee on carpet. I pick up my writing bag and wicker tray with candle, lighter and Bible, and decide where to spend my moments. Once settled, I light my candle (a new habit) reminding me of the holiness of this morning quiet. I hole into the corner of my over-stuffed couch, pick up my journal and write. I do all this with such delicate care, like applying mascara or painting along the line where ceiling meets wall. Maybe, if done properly, the moments will act as a magic elixir, causing me to be more patient during the day, meet my children with an extra measure of grace, see more holiness, bear witness to more moments. But there is no magic, no promise of serenity to my day. There is just moving from one activity to the next—football practice to dishes to exercise to more dishes to random facebooking back to dishes…on and on the cycle goes. Kids jump on and off my merry-go-round, needing, asking, wanting, irritating and occasionally stalling the whole darn thing by just being them. Still, in all of this, there must be moments. There are moments and—confession—sometimes I see the moments, but don’t slow down to live in their heavenliness. Why? Why do I waste these invitations? If you could see the glory of God right in front of you, opened and asking you to stand in His beauty, wouldn’t you accept? Maybe. But maybe you (meaning me) would worry about wasting time or not getting the checklist checked (which never happens anymore, anyway). Or maybe it is just plain ole’ hard to express some moments—most moments—once you’ve had them. They flit like the birds at my feeder: flying in from a nearby tree, taking a few pecks, then flying back to the safety of leaf and shade. Barely there long enough for me to admire the color of their wings. But while I have them in sight? Oh my—their songs fill the space around me, their head bobbing makes me smile. When I am in a moment with these little creatures, the noise in my head goes away and all is calm. All is peace. This is as close as I come to serenity. Two weekends ago, I enjoyed an entire weekend of serenity. 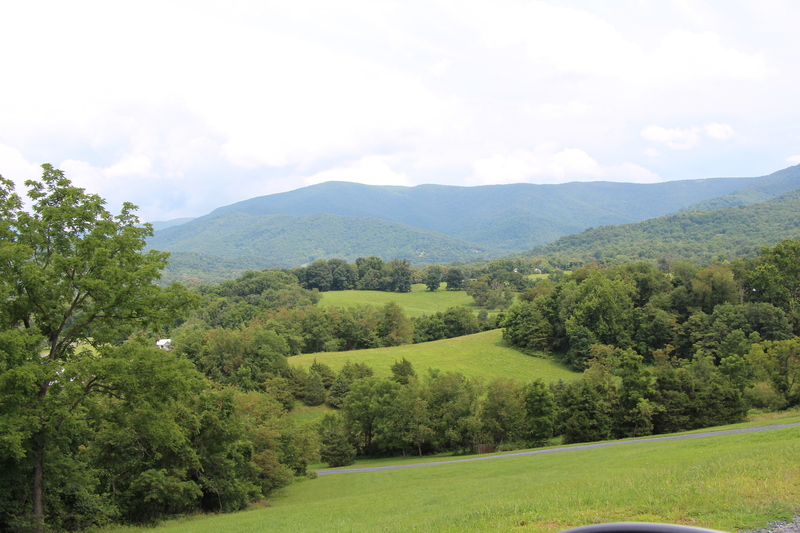 I left my new home, and drove two hours into the Shenandoah Valley to a little cabin among the Blue Ridge Mountains. I met no one once there; I did not attend a conference or workshop. I went to be alone and to—hopefully—write. I was much afraid. Would I really write? Would I go crazy from lack of distraction—though I hate distraction more than anything, I seem easily seduced by it. Or would I come to some heart-rending “Jesus moment” where I had to face all my troubles and sin issues and baggage I didn’t even know I carried before I could ever put pen to paper. No. None of these happened. 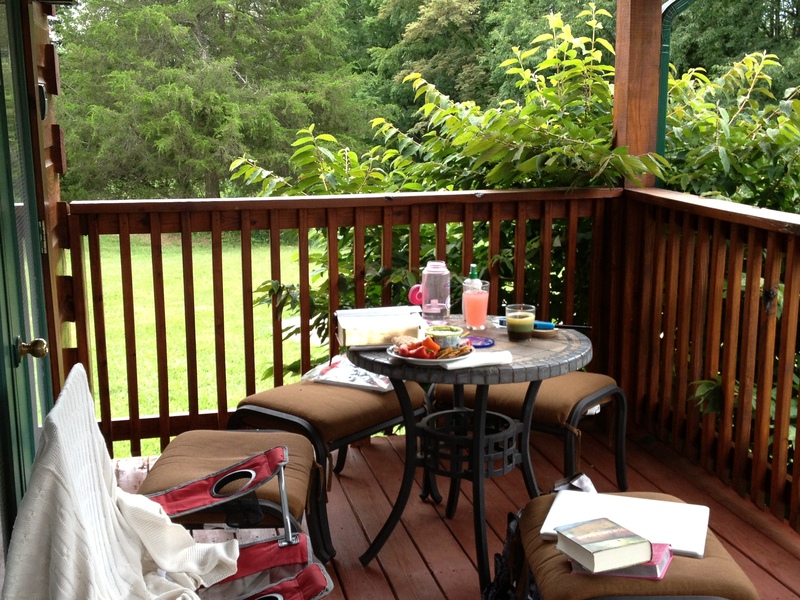 Rather I melted into the scenery around me, took advantage of fair weather and a wide front porch with small table set perfect for a weekend of writing out-of-doors. Talk about moments! A swallow-tail butterfly playing peek-a-boo all weekend, clouds to make the sun’s rays dance, poetry and the Psalms read out loud with no one to ask me what I needed or wonder why I’m talking to myself. Rain playing percussion on the cabin’s tin roof. Reading every night in perfect solitude, slowing down over the turn of words and making notes of my thoughts at their meanings. And the writing—oh the writing! Hours upon hours spent pencil to pad, creating scenes and characters and stories. I didn’t worry whether the writing was good. I didn’t slave over sounding smart enough, literary enough, worthy-of-following. My mind had space to wander, invent, look inside its own wrinkles. But for a time, I felt the sweet moments of serenity. Their kisses are still fresh on my face, even after two weeks of real life. If this was true 60 years ago when she wrote—on her own quest for inner peace, serenity and living in the holy moments–how much more true is it for woman today? Lord on High, help me nurture and grow the gift through continuing to notice moments, and faithfully sharing them to bring you glory. Amen.